The conditioning time was pretty long. The surface forms a layer of Nickel oxides along with Chromium oxide as well and in the case of 316L you have @ 2% Molybdenum in the SS alloy but you could be right about the Cr oxides acting as a dielectric. Nickel passivates in air and forms oxides like Zinc in galvanised form. Example: incase you need to electroplate on nickel you need to reactivate the surface layer before the plating process or the plated layer just peels off. The initial conditioning is very very important and I recommend to use the process I posted as with lesser Amps you form a thin fine grain layer and once you increase the Amps the grain size of the deposition layer increases. The bigger grains can come off the surface easily...so once you do this you go back to the longer time low Amp conditioning in the process I posted...this again reinforces the larger grains deposited during the high Amp conditioning to bond to the base / previous layer. I have never posted this info before but this is the reason why different Amp levels are used in the process. I have to give the reasoning for the low Amp conditioning as a lot of replications seem to be taking the short cut method of conditioning at high Amps to save time. PLEASE DONOT GO ABOUT CONDITIONING WITH HIGH AMPS ONLY AS YOU'LL ENDUP HAVING A WEAKLY BONDED COAT. LOW AMP CONDITIONING IN EXTREMELY IMPORTANT FOR PROPER BONDING OF LAYERS TO THE BASE METAL and the previous layers. FOLLOW THE POSTED PROCEDURE. It’s a time consuming process but worth the effort. The bond strength of the layer can be increased further as after every cycle of conditioning you need to stop for at least an hour. During this period you can let the pipes air dry only after every cycle...this compacts the layer even more due to the loss of moisture from the surface...then change water and go about the conditioning cycle. Never touch the layer till it dries up completely. Ravzz states- IT DESCRIBES WHAT REACTIONS HAPPEN DUE TO CONDITIONING!! IT SAYS THIS CONDITIONING COAT FORMS IN WATER WITH NICKEL.....WELL SS316L HAS THE MOST AMOUNT OF NICKEL IN THE 300 SERIES! This even confirms the reason why there is a glow in the WFC and even confirms that it can be seen only when its dark...and that’s what I had seen. Looks like this the key to what happens during and due to conditioning. The doc even talks about cold fusion taking place in the cell.....and over unity due to the conditioned coat!! These docs should put an end to the reason why conditioning is so important and why the step conditioning needs to be followed. The following may be related, could the plasma version of the "diode effect" mentioned in papers previously mentioned above. In one of Stan’s patents he talked about using polyoxymethylene (Delrin) which has a high dielectric constant. 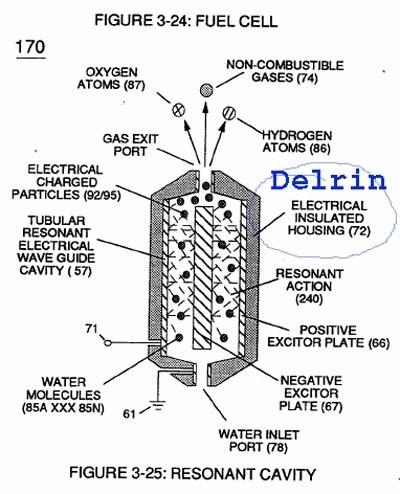 He used Delrin on the outside of the outer pipe and the inside of the inner pipe to contain the electron leakage. The barrier formed by the conditioning coating has a comparatively lesser dielectric constant than the Derlin material thickness used. 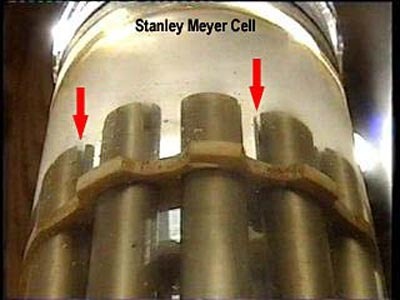 The picture below clearly shows there are slots in Stanley Meyers tubes, light can be seen though the slots eliminating the possibility of it being spacers. A Rectangular slot cut in the top of each tube can clearly be seen. 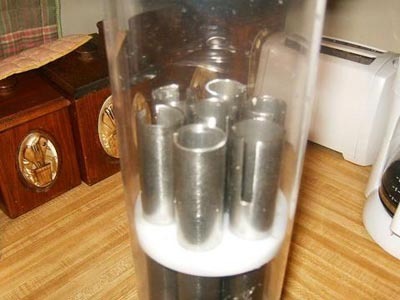 Since we are dealing with an acoustic resonance it makes sense to create slots in the positive of the tubes to help mimic the resonant frequency of the negative tubes. It is not known for sure why Stan did this at this time. Please consult the original D14 document for more back round. The original D14 document described a way to create the same resonant pitch when constructing. Please consult the original D14 document. An engineer has contacted Panacea and offers the following advice. Message: I have duplicated Stan Meyer's work, and have taken it several steps forward. First, during assembly of the generator, I have found that you must tune the tubes to the same pitch. I do it with a simple guitar tuner. Just clip it to the tube and strike it with a small brass (to prevent polarization) hammer. The easiest way to change the pitch, it's always the outside tube, grind a notch in it like Stan did. If you are experimenting with the cold current circuit, and wish to alter the values of the circuit components for example the capacitors. Please keep the following in mind. Ignoring some relatively minor construction features, capacitors are all the same. They act as a reservoir for electrons. If you have a lot of electrons like in a power supply, then you need big capacitors - the bigger the better. If you are passing low frequency AC through a capacitor, then when the signal is high, electrons will flow into the capacitor. When the signal goes low, those same electrons will flow back out. You need to make sure that the storage capacity inside the capacitor is big enough to handle the current flowing in and out. If the frequency is high, then the signal is only high for a very short time and so not much storage capacity is needed. Consequently, high frequency capacitors can be very small in size. BUT if the capacitor is high quality and has low leakage as a component, then a large capacitor can do the job at high frequency just as well (though it is physically bigger, heavier and more expensive) - just commonsense really. When used in a timing or oscillator circuit, small capacitors fill up faster and as the circuit switches over when the capacitor is full, the generated frequency is higher. 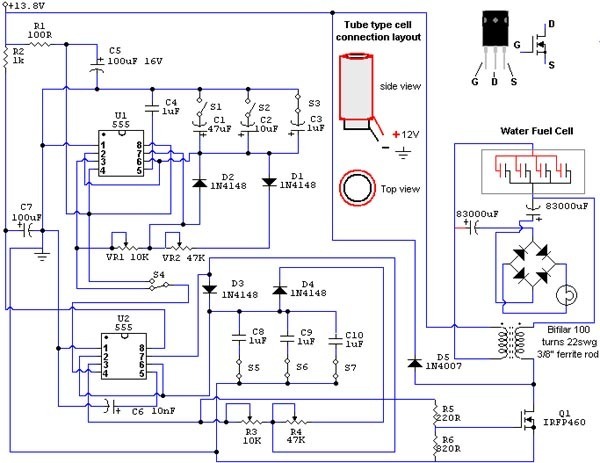 The rate of current flow into a capacitor is controlled by the size of the resistor feeding it - the higher the resistor value, the lower the current flowing through it, the slower the capacitor charges up, the lower the frequency of the oscillator. You will see this in, say, Dave Lawton's circuit where the frequency range is selected by switching a larger capacitor into the circuit to get a lower frequency. 47, 10 and 1 microfarad for slow, medium and fast gating while the high frequency oscillator which is being gated has 0.22, 0.1 and 0.01 microfarad capacitors giving a very much higher frequency. (The old version was drawn with the switches operating in opposite directions).There is lots of scope for variations, but typically, 10 microfarad capacitors are for switching in the 10 Hz or lower region, 0.1 to 1 microfarad for high audio frequencies, and 0.01 or smaller for ultrasonic or radio frequencies. A third party has confirmed that after speaking to Dave Lawton on the phone he expressed the opinion that the size of the capacitors was not particularly important as the frequency was high. Dave was doubtful about that and said that the bulb lit better the larger the capacitor was. So, although some may see no logic for it at all, it is better to go with very large capacitors. Note ?on the circuit it looks as it is a DC cap. There is no such thing as "an AC capacitor" or "a DC capacitor" there are just "capacitors". They are all the same, with the slight exception of manufacturing differences in the materials used. Tantalum has minimal leakage and can hold their charge for days on end, but they don't go above 1 mF in capacity. Electrolytic capacitors can have massive capacities but their leakage can be massive with the charge bleeding off rapidly from really big ones. So there is no AC or DC capacitors, just "capacitors" and any of them can be used for any application. Low capacitances can't handle low frequencies properly as they fill up long before the waveform has returned to zero, so the waveform gets chopped off and highly distorted. By showing the capacitors that Dave used, without making it clear that he used those capacitors as they happened to be sitting on his bench at the time he was experimenting with the circuit. It is highly likely that any electrolytic capacitor will work in that position. Just whack one in and see if it works well. A 'common-or-garden' 1000mF would probably do very well - just try whatever is to hand. It is definitely NOT the case that Dave tested lots of capacitors and found that the only ones that worked were the ones shown in the circuit. Copyright © 水の電気分解　HHO＆ブラウンガス実験所（仮） All Rights Reserved.